Who doesn't like to paint on a Saturday afternoon under the cool shade of Eucalyptus trees in one of the San Francisco Architectual treasures, Palace of Fine Arts. We will be learning the delights of acrylic painting finding our own unique style with gifted local artist, Molly Moo. This short evening is designed to satisfy your artistic spirit and paintbrush your imagination, capture the beauty of landscapes and structures, creating amazing artworks, make memories with friends while relaxing and sipping some local wines from around the Bay. Artist will guide you through each steps of Acrylic painting during the event. 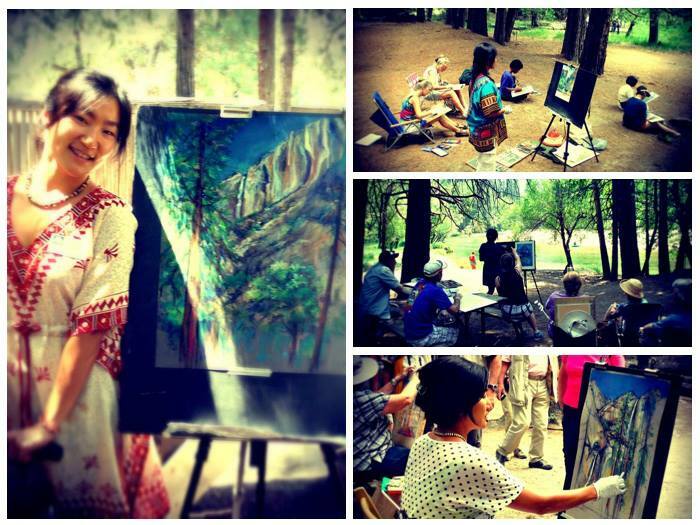 Enjoy summertime in Yosemite with our gifted pastel artist Tsungwei Moo (Molly) who will share her personal artistic perspective, encouraging you to find your own unique style with soft pastels. Take this opportunity to capture the beauty of the summer landscape, creating Yosemite artwork to satisfy your artistic spirit. Sit in the shade and let your imagination respond to the shifting light and shadows while you learn the delights of pastel and the specific skills needed to complete a beautiful picture. At the end of a rewarding day, enjoy your own artistic creation. Time: 9:45 am to 2 pm, Monday through Saturday. Please arrive at 9:30 am if you need to purchase supplies at the art center. Materials: Supplies are not included. However, supplies are available for purchase at the Yosemite Art Center. All purchases benefit the park!